A lot of Alaskans are waiting for Gov. Michael Dunleavy’s administration to release its proposal for next year’s budget. It is widely expected to contain deep cuts to state services as Dunleavy’s administration tries to balance state spending to revenues. But Alaskans aren’t the only ones who are waiting to see what’s on the chopping block — the credit rating agencies are watching too. There are some basics to the formula that go into calculating a credit rating. If bills get paid on time, the credit rating goes up. Pay them late, or not at all, and it goes down. A credit rating is, essentially, a measure of how willing and capable a person on entity is to pay the bills. At some point this year, the state of Alaska’s Department of Revenue plans to borrow $740 million to pay down some of its debt. A big part of how cheaply the state can get that money is its credit rating. But there are some factors that determine the state’s credit rating that the average Jane doesn’t have to worry about. For one, oil prices. That’s the main source of revenue that Alaska has to pay its bills. So when oil prices crashed in 2015, the state’s credit rating took a beating. 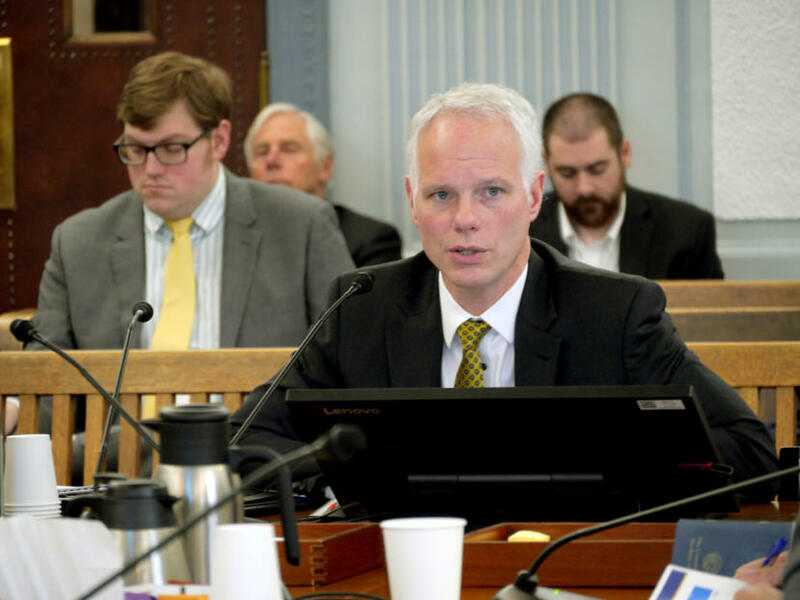 “Over the course of the last four years, we’ve been downgraded seven times, and I bet there’s been twice that many rating agency reports with negative news on the state of Alaska,” said Department of Revenue State Investment Officer Deven Mitchell. He’s the state’s debt manager. Back in 2017, staff at the Department of Revenue — where Mitchell works — went out on a mission to try and convince the credit rating agencies to stop downgrading the state. They argued that Alaska could, in fact, pay its bills. They laid out their argument using the $60 billion in the Alaska Permanent Fund. Think of it as a gigantic savings account the state has had in its back pocket for the last 40 years. Department of Revenue managers met with the ratings agencies — Moody’s, Standard & Poor’s and Fitch — arguing that even though it had never been done it before, if the Legislature chose to use the permanent fund’s investment earnings to pay for state government, there would actually be plenty of money available to pay its bills. “I think we changed the outlook to ‘stable’ based on the idea that the state had come up with a way to fund itself using its permanent fund earnings as a sort of mechanism to fund a big chunk of the operating budget,” said Moody’s analyst Ted Hampton. He’s the lead analyst for Alaska at the credit rating agency. Hampton said Alaska has been experiencing the downside of relying on oil to fund state government, because prices are volatile. When prices crashed, some of those basics of a credit rating kicked in, because even though the state was willing to pay its bills, it was no longer clear that it was capable of doing that. There’s one more thing that Alaska has to deal with when it comes to its credit rating: PFDs. Those checks Alaskans get every year come out of the earnings of the permanent fund, too. And for the last few years, those checks were capped by the former governor and the Legislature, with the idea of leaving more money to fund state government. It’s not that the act of paying dividends is a problem for the state’s credit rating from Moody’s. “We’re agnostic, really, on the issue of whether the state is paying dividends or how big those dividends are. I mean, the big question, really, is whether the state is able to demonstrate budget balance from year to year, even when the economy is not doing so well,” Hampton said. Right now, there’s a plan in place that kept the state’s credit outlook stable. But there a new governor, and his administration has a new plan for the state’s budget — one that doesn’t involve capping PFDs. Instead, it relies on cutting state government. Though that may be easier said than done. Moody’s isn’t likely to jump at changing the state’s credit rating based solely on Dunleavy’s new budget when it comes out. Hampton said they tend to wait for proposals to become reality. That new budget is set to come out on Feb. 13.